Elisabeth Mannering Congdon was born in Duluth on April 22, 1894. Shed attended prep school at Dana Hall in Wellesley, Massachusetts, before attending college at Vassar. In 1916, following her father’s death, Elisabeth dropped out of Vassar to move back to Glensheen and take care of her mother and help her run the family’s grand estate, Glensheen. She became an active volunteer, working with charitable and civic organizations and serving on the boards at Syracuse University and Dana Hall. 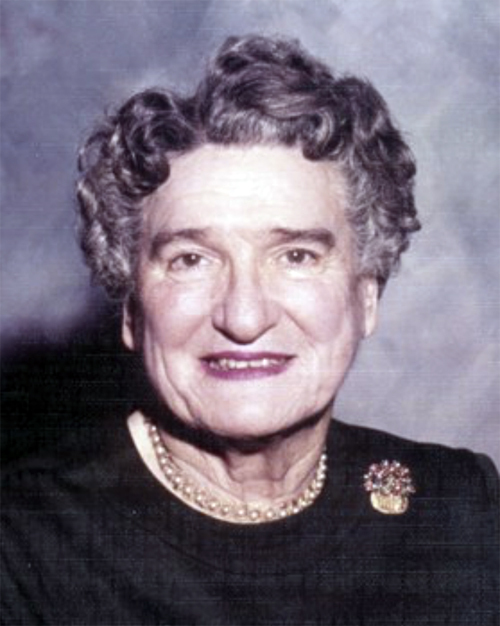 She was the first president of Duluth’s Junior League, served on the board of St. Luke’s Hospital’s Guild, organized Duluth’s American Red Cross Nurse’s Aid Committee during World War II, and established a woman’s clinic with her friend Dr. Elizabeth Bagley. Elisabeth never wed. She had long been involved with Fred Wolvin, son of Duluth industrialist Captain August Wolvin, but rejected his marriage proposal. She was an active volunteer at St. Luke’s Hospital, and in the 1930s she and her dear friend (and physician) Elizabeth Bagley established a clinic for women. In 1932 Elisabeth adopted a three-month-old girl in North Carolina and named her Marjorie after her sister. Three years later she adopted another baby girl and named her Jennifer Susan. According to author Gail Feichtinger, while Elisabeth’s daughters may have lacked a father, Robert and Edward—whom everyone called “Ned”—provided them with a male presence. Elisabeth relied particularly on Ned for help. He lived nearby and frequently looked in on his mother, sister, and nieces. Jennifer recalled that Uncle Ned told wonderful stories, and she and Marjorie would take turns sitting on his lap and listening to his tales. Robert and Elisabeth were also close, and Jennifer enjoyed a good relationship with her Uncle Bob; when she married, Bob gave her away. Marjorie preferred the company of her namesake, Marjorie Dudley, and her husband Harry. Clara, of course, also helped raise the girls, passing along her Methodist values. Before the girls headed off to boarding school, Clara, Elisabeth, Marjorie, and Jennifer divided their time between Duluth, Tucson, and Yakima. Both girls attended grammar school at the Duluth Teacher’s College model classroom and, like their mother and aunts, attended Dana Hall boarding school. From the day after Christmas through Easter the four traveled to Elisabeth’s desert home on the outskirts of Tucson and visited Helen, who lived in the Arizona city. During World War II Elisabeth volunteered at Duluth’s St. Luke’s Hospital, rolling bandages. In the late 1940s, she and her daughters began spending much of their summers at Swiftwater Farm, a six-bedroom house on the Brule River in northwestern Wisconsin Elisabeth had purchased and renovated. The girls went swimming, canoeing, and tubing on the river, exploring and running around in bare feet. Edward had a summer home nearby, providing many Congdon cousins to visit and play with. The casual lifestyle at Swiftwater was a welcome contrast to Glensheen’s formality. “At Glensheen, we always had to dress for dinner. You had to have a dress and shoes on. You couldn’t come barefoot to the table,” Jennifer said. The passing of time came with the passing of more family members. Walter died in 1949 from a heart attack, just like his father and his brother Edward, who had passed away in 1940. Clara died in July 1950. At the time of her death, she had seventeen grandchildren and fourteen great-grandchildren. Alfred died in 1952. The following spring Elisabeth’s daughter Marjorie, just nineteen years old, married Richard LeRoy at Glensheen. In 1955, after graduating Boston’s Garland College, Jennifer wed Chuck Johnson in Glensheen’s formal garden. Elisabeth then became Glensheen’s only resident who wasn’t part of the staff. She continued to travel, often with Dr. Bagley. There were tough times as well. Young Marjorie had difficulty handling finances, and Elisabeth often had to bail her out. In 1966 Helen died, followed a year later by Robert. The elder Marjorie passed away in 1971, leaving Elisabeth as the only remaining child of Chester and Clara Congdon. In 1968 Elisabeth had a massive stroke. She lay comatose for ten days and suffered serious brain damage. Her right side was left partially paralyzed. Nearly deaf and also suffering from diabetes, she required daily insulin shots and was confined to a wheelchair, rendering her dependent on around-the-clock nursing care and live-in servants. She also suffered from aphasia, a loss of the ability to speak and express ideas. Following Elisabeth’s stroke, the Congdon Trust approached the University of Minnesota to take over the estate. Chester and Clara’s eldest grandson, Guilford H. Congdon (Walter’s son), was in line to inherit Glensheen, but he agreed that the best way to ensure the Congdon family’s legacy in Duluth was to give it to the university. Elisabeth, however, would continue to call Glensheen her home—the agreement allowed her, as well as gardener Bob Wyness and his wife, to remain at Glensheen as long as they lived. Through self-determination and a lot of physical therapy, Elisabeth continued to live a quiet, dignified life at Glensheen and enjoyed trips to her beloved Swiftwater Farm, which she last visited on Sunday, June 27, 1977. The next day the bodies of Elisabeth and retired nurse Velma Pietila were discovered at Glensheen. Both had been brutally murdered. The investigation led authorities to believe that the killings were masterminded by Elisabeth’s daughter Marjorie, who had exhibited antisocial behavior since she was a child. By 1977 she had driven one husband to bankruptcy, divorced him, and wed another. Her husband Roger Caldwell was convicted of the murders. Marjorie was acquitted of conspiracy, after which Caldwell was released following a plea bargain intended to avoid a retrial. You can learn more about the crimes and trials here. 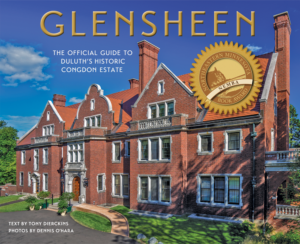 From Glensheen: The Official Guide to Duluth’s Historic Congdon Estate, by Dennis O’Hara and Tony Dierckins (Zenith City Press, 2016) featuring over 250 modern and historic photographs. Click on the cover to preview the book.